The BNP Paribas Group’s foundation in Germany was founded in 2015. It supports educational, art and culture projects throughout the country. In doing so, it specifically supports children and young people who have to overcome hurdles and barriers in their own personal biography, for example as a result of social disadvantage, disability or a migration or refugee background. As a foundation of a globally active banking group, the BNP Paribas Foundation promotes the guiding principle of international dialogue. The projects that it supports bring young people with different backgrounds and origins together – thus contributing to intercultural understanding and solidarity. All children and young people should be given equal opportunities to discover their own strengths and talents to be able to develop and evolve in the best possible way. 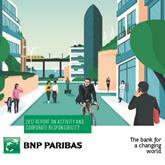 More details about the BNP Paribas Foundation in Germany are available on the German page. Homepage of the international BNP Paribas Foundation (external Link).